The first-generation Skagen Falster was hailed as one of the best-looking smartwatches in the market at launch, but critics were quick to point out the lack of features and the underwhelming battery life offered by the wearable. Just a few months back, the Fossil-owned brand announced the global launch of the successor, predictably called the Falster 2. Right before its Indian launch, I received a review unit of the smartwatch and having spent some time with Falster 2, I would like to share how the Google Wear OS-powered watch has fared for me in the last two weeks and whether it is plagued by the same issues as its predecessor or not. The Falster 2 is a looker for sure. Taking design cues from the first-generation Falster, the new watch comes with a minimalist design and looks incredible. But probably the best thing about the Falster 2 is that it doesn’t just look good, but feels extremely comfortable to wear too. The downward-facing lugs on either side of the circular casing ensure that the watch’s strap is wrapped neatly around the wrist. The review unit that I received came with a magnetic steel mesh strap that essentially gets rid of the requirement of a buckle. This means, irrespective of the size or shape of your wrist, the strap will sit nicely and can be adjusted easily too. It further helps that the steel mesh strap provides the smartwatch with a premium look that grabs eyeballs without you even flaunting. In case, you have a different taste and want to go for a more subtle look, the 20mm straps (which come with quick release pins) are interchangeable and you can choose a different option from Skagen’s official website or just use any regular watch strap procured from the market. The watch case looks a tad thick, but to Falster 2’s credit, I had to check whether I was even wearing the watch on certain occasions as it feels remarkably comfortable, unlike some other heavy watches. The watch gathered some scuffs after around a week but as these marks are not noticeable in regular use, this is not an issue. The crown is one of the most crucial aspects of the Falster 2. Although I didn’t face many issues with the responsiveness of the display, I still preferred to navigate through most applications and menus via the crown. By simply rotating the crown, you can scroll through menus with ease. The Falster 2’s crown feels tactile and you won’t find any issues with it as it functions smoothly. On the back of the watch case, you’ll see the heart-rate sensor placed between concentric metal rims that enable charging. On the right side of the watch case, the microphone is placed right above the crown. The most visible change, as compared to the previous version, is the addition of two buttons, placed on either side of the crown. To recall, the first-generation Falster just had a crown and no separate buttons. The cherry on the top is that you can assign any preferred functionality to both these buttons. I assigned the bottom button to the Google Fit app, which meant I could check my heart rate by simply pressing this button twice at any time. I assigned the top button for reminders but you can choose to assign any other feature of your liking. The circular 1.2-inch AMOLED panel on the Falster 2 comes with slimmer bezels in comparison to the first-generation watch and has a screen resolution of 390 X 390 pixels. As you might expect, the AMOLED display offers vibrant colours and deep blacks. By default, the brightness is set to automatic but you can head to display settings and choose from one of the five brightness levels according to your requirement. I never felt the need to change the brightness level manually as the watch is quite efficient in deciding the required level for the respective environment. Overall, the display quality is impressive and I had no issues reading the text on the screen even in outdoor conditions. In case you are in a dark setting, you can even choose the flashlight feature on the watch, which turns the screen white and sets the brightness to max. The AMOLED panel gets bright enough for this particular requirement. Let’s move on to the hardware that powers the Skagen Falster 2. 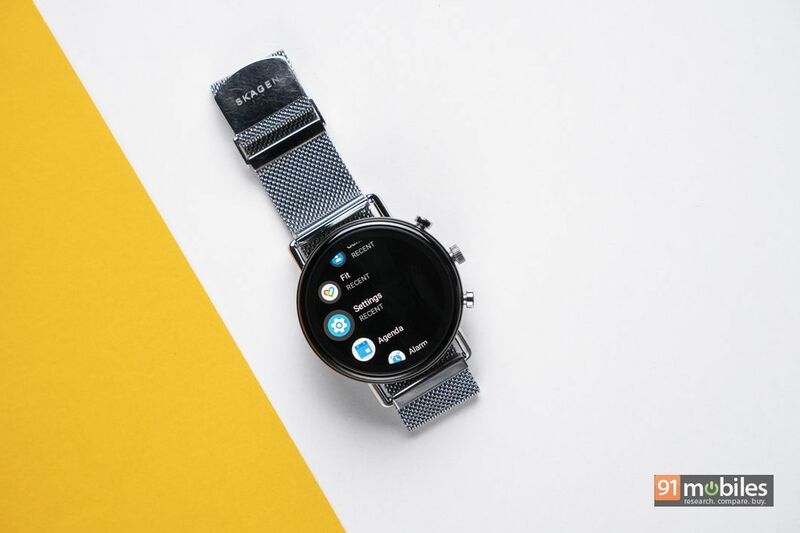 Just like the original Falster, the second-gen smartwatch is powered by Qualcomm’s Snapdragon Wear 2100 processor and comes with a 4GB built-in storage. Before you judge the brand for using a three year-old platform, it should be kept in mind that Qualcomm launched its Snapdragon Wear 3100 after the Falster 2 was made available in the market. The watch comes with a heart rate monitor, which records your heart rate at regular intervals, and support for NFC and GPS. These can be considered the most important additions in comparison to the original Falster. The watch supports Google Pay but that’s not available in India anyway. Considering that the watch comes with a 3ATM water resistance rating, it should survive even in a pool. The Falster 2 runs Google’s Wear OS 2.1 smartwatch user interface. This means, with a simple swipe up from the home screen, you can get access to all your notifications. With a downward swipe, you get access to various toggles like Airplane mode, flashlight, and battery saver among others. There are some Google apps pre-installed, mostly fitness-oriented, and the learning curve for the platform is not steep at all. Notably, to perform certain actions, you will still need to use your phone. The translation app works like a charm and users can simply speak into the watch’s mic to get sentences translated within seconds. Another important use case is that you can choose to pick up the calls (to be received on the phone) or dismiss them through the watch itself. If you are listening to songs with earphones plugged in, receiving calls through the watch can be an incredibly comforting experience. On the other hand, spam calls can also be avoided as the Truecaller app on the phone also displays caller information on the watch’s display. In case you do not like the pre-loaded watch faces, you can install some new ones from the app store as well. In most cases, you will be required to go through the setup process on the phone app as well. As watch faces can change the entire look of the watch, you might want to try out some new ones every now and then. Personally, after the initial curiosity, I settled for one of the preloaded watch faces as it offers an elegant feel to the wearable. As far as customisation choices go, to each his own. I primarily used the watch with an iPhone but to get a better idea about the watch’s compatibility with Google’s own platform, I paired it an Android phone as well. In comparison to iOS, you will get more choices in the Google Play store for watch faces. Although I could access the Google Play store on the watch earlier as well, doing it on a phone is a much convenient task, to say the least. If you use the Find my phone feature from the watch, the watch essentially makes the handset ring and can prove to be helpful at times. In general, if we talk about the performance, opening up apps and closing them feels a tad sluggish. Even the tilt-to-wake-up feature, despite being handy, wakes up the watch with a slight delay that is noticeable. Maybe if Skagen would have waited out a few months and launched the watch with Snapdragon 3100, most of these issues would have gone away but there is no point talking about ifs and buts here. 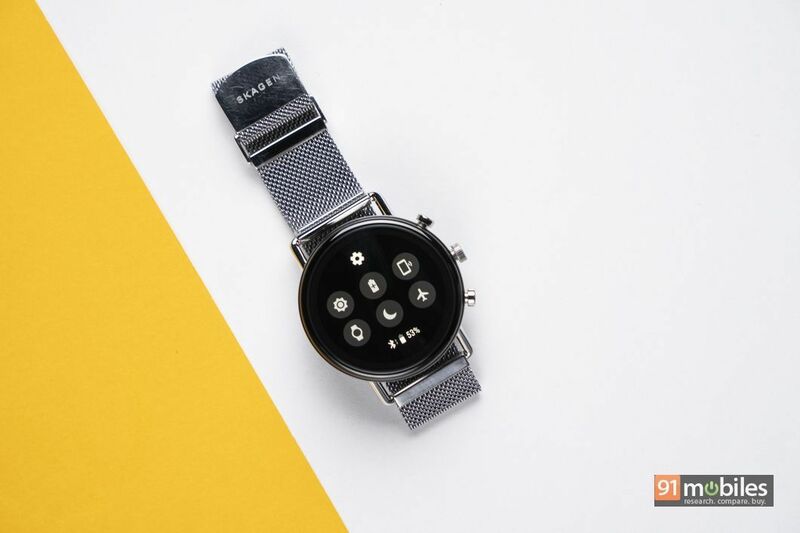 As Google has recently bought Fossil’s smartwatch technology, we can expect the two brands to work closely and develop products that have a great synchronisation between software and hardware going forward. As you might have understood by now, there is a lot to like about the Falster 2. However, unfortunate as it is, the smartwatch’s Achilles heel is the same as its predecessor. There is no easy way to put this, but the 300mAh battery on the Falster 2 struggles to go through an entire day on a single charge. This can get frustrating at times because most other smartwatches in the market have come a long way in this department and offer a much better battery backup in general. The poor battery life can be partly attributed to the inclusion of an older processor as well because Snapdragon 3100 manages to offer a much-improved battery life on the wearables. As I mentioned earlier, I kept brightness at ‘automatic‘, instead of choosing the highest brightness level and even on working days, when most of my time was spent indoors, the Falster 2’s battery life did not manage to impress me. If you are planning to buy this smartwatch, this should be your most important point of consideration. If you are wondering about the charger accessory, the Falster 2 comes with a USB charging cable with a magnetic charging pad at the other end. Interestingly, the design of the charging pad is almost identical to the charging accessory offered by Apple for its smartwatches. Fossil’s Skagen brand has come a long way with Falster 2 and some of the key features missing from the original watch have now been added with the second iteration of the wearable. The Falster 2’s design and the inclusion of heart rate monitor, NFC, and GPS, along with 3ATM water resistance make for a strong case in the smartwatch’s favour. 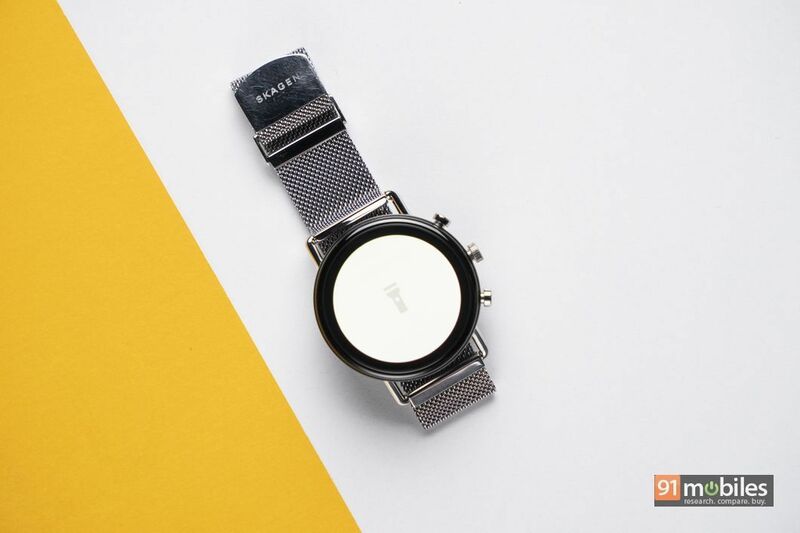 Although the battery life offered by the watch is underwhelming, we can still say that Falster 2, priced at around Rs 22,000 mark, is still a very good option in this price range. In case you want a better battery life, you might want to look at an option like the Samsung Galaxy Watch (review), while the Fitbit Ionic (review) might fit your bill better if you’re serious about fitness.